SAVE and Be the First to See “Ain’t Too Proud” before it heads to Broadway! BIG Ticket Discounts on premium tickets for this LA Musical. 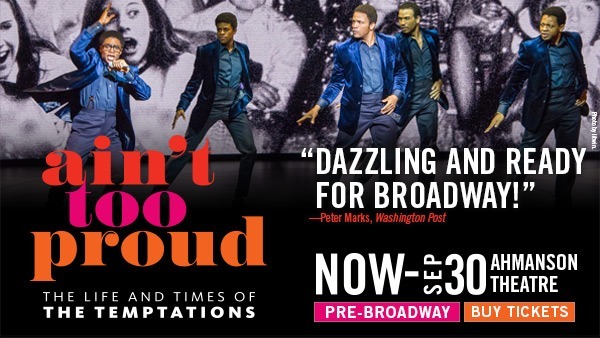 Ain’t Too Proud is an electrifying new musical about the life and times of The Temptations, the greatest R&B group of all time (Billboard Magazine). Five young guys on the streets of Detroit were discovered by Berry Gordy, who signed them to his legendary new label. With their signature dance moves and unmistakable harmonies, they rose to the top of the charts—creating an amazing 42 Top Ten Hits with 14 reaching number one. Through friendship and betrayal amid the civil unrest that tore America apart, their moving and personal story still resonates five decades later. Kennedy Prize-winning playwright Dominique Morisseau (Detroit ’67,Sunset Baby,Center Theatre Group L.A. Writers’ Workshop 16/17 participant), Olivier Award-winning choreographer Sergio Trujillo (Memphis the Musical,On Your Feet! ), and two-time Tony Award®-winning director Des McAnuff (Jersey Boys,Big River) bring you this thrilling new production featuring iconic hits including “My Girl,” “Just My Imagination,” “Papa Was a Rolling Stone,” and many more. Go tohttps://www.centertheatregroup.org/promo?code=DETROIT to purchase $49 Orchestra seats (reg. $75) for select early performances through September 16!